We consider the reduction loss of security reductions for non-interactive key exchange (NIKE) schemes. Currently, no tightly secure NIKE schemes exist, and in fact Bader et al. (EUROCRYPT 2016) provide a lower bound (of \(\varOmega (n^2)\), where \(n\) is the number of parties an adversary interacts with) on the reduction loss for a large class of NIKE schemes. We offer two results: the first NIKE scheme with a reduction loss of \(n/2\) that circumvents the lower bound of Bader et al., but is of course still far from tightly secure. Second, we provide a generalization of Bader et al.’s lower bound to a larger class of NIKE schemes (that also covers our NIKE scheme), with an adapted lower bound of \(n/2\) on the reduction loss. Hence, in that sense, the reduction for our NIKE scheme is optimal. J. Hesse—Parts of work done while at École Normale Supérieure, Paris, supported by ERC Project CryptoCloud FP7/2007-2013 Grant Agreement no. 339563. D. Hofheinz—Supported by ERC Project PREP-CRYPTO (724307), and by DFG grants HO 4534/4-1 and HO 4534/2-2. L. Kohl—Supported by ERC Project PREP-CRYPTO (724307), by DFG grant HO 4534/2-2 and by a DAAD scholarship. Parts of work done while visiting Interdisciplinary Center Herzliya. We would like to thank Kenny Paterson for collaboration at early stages of this work. 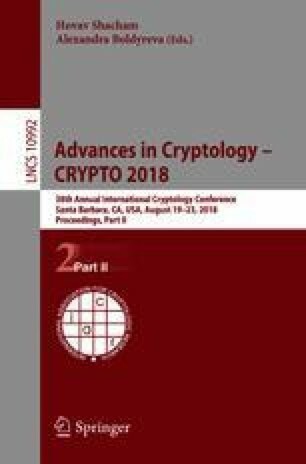 Also, we would like to thank the anonymous reviewers of Crypto 2018 for their helpful comments.